Mahāsthāmaprāpta (Ch 大勢至 Da Shì Zhì, Jp. 勢至 Seishi) is a Buddhist bodhisattva that represents the power of wisdom and is often depicted in a trinity with Amitabha and Avalokitesvara. 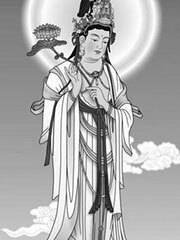 In Chinese Buddhism, he is usually portrayed as a woman, with a likeness similar to Guan Yin. He is also one of the Japanese Thirteen Buddhas. Unlike many of the bodhisattvas of Buddhism, Mahasthamaprapta has not gained as much popularity as many of the bodhisattvas that are usually mentioned. In the Surangama Sutra, Mahasthamaprapta Bodhisattva tells of how he gained enlightenment through Buddha recitation, or continuous pure mindfulness of the Buddha, to obtain samadhi.